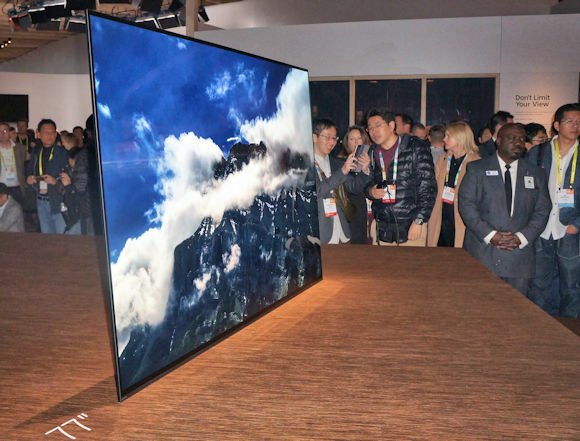 At the 2017 CES, Sony put the world on notice that it was back in the OLED TV game, after launching the technology with a very small screen sub-HD quality display a decade earlier. The company that gave us the Trinitron picture tube back in the Sixties, presented its Bravia XBR A1E series 4K OLED TVs in three screen sizes — 55, 65, and 75 inches, albeit with a panel made by LG Display, this go round. While achieving market-leading 4K picture quality is the goal in developing any high-performing 4K television–particularly in a premium 4K OLED– Sony’s first stab at the category delivers images that stand up with the best televisions of 2017, including LG’s 4K OLEDs. Indeed, the Japanese TV maker managed to differentiate itself from its competitor by delivering an elegant, modern cosmetic design punctuated by a heretofore unique built-in sound system. The audio in this set uses the OLED panel itself as a vibrating stereo speaker system and the sound produced by this dazzler is not only surprisingly robust, it tantalizes in its ability to make aural effects follow objects around the screen while not cluttering the look of the cabinet with bulky speakers. At the recent CES 2018, Sony came out with its second-tier of 4K OLED TVs and the sound and image quality is expected to remain pretty much the same as in the A1E models. The key difference in the Bravia XBR55AF8 and XBR65AF8 from the A1Es is in the outward design. The newer class eschews the integrated easel stand of the A1E for a more traditional tabletop stand that doesn’t have the same degree of back-leaning tilt. Importantly for wall mounting installations, it also doesn’t have as wide a gap between the panel and a mounting bracket, which might make those models (available in 55- and 65-inches only) better choices for the situation. But when mounted atop a flat surface, like a table or entertainment cabinet, the 65A1E is one of the most striking looking televisions we’ve ever seen. Styling: As mentioned, the XBR-65A1E has a unique easel-style stand which is attached by a hinge toward the top of the set. This allows the bottom of the frame to sit flat atop a stand or table surface. The top of the screen tilts slightly backward, like a framed picture. To keep the set upright, the stand spreads out about a foot at the base and adds weight compensation for support. A stabilizing bar keeps the easel in place and securely connected to the television. The subwoofer for the television is incorporated into the stand. For wall mounting, the stand folds up against the back of the set. A VESA-standard wall-mount bracket can be connected to the back of the stand, but this will add an extra gap of about 3.5 inches between the panel and the bracket. The A1E’s integrated easel stand. Wall mounted Sony XBR-65A1E showing 3.4-inch gap between the panel and the wall surface. Picture quality: LG Electronic’s 2017 OLED have famously won several TV shootouts around the world, but the margin of victory must have been minute, because the image quality of the Sony 65A1E and the LG65W7 was pretty close to even in our tests, and both presented some of the best pictures we reviewed that year. That’s not to say there weren’t some standout LED-LCD TVs in 2017, but none of them had the black level, viewing angle or thin-cosmetic styling of the OLEDs. HDR: The Sony XBR-65XA1E does a masterful job with HDR10 and, thanks to a recent firmware update, almost as well with hybrid log-gamma (HLG), especially when viewing the recent 2018 Winter Olympics from PyeongChang, So. Korea. Watching the opening ceremonies from DirecTV, which were output via HLG by the Mini-Genie thin client, we saw a distinct boost in brightness highlights and color, which seemed to make the 4K resolution standout all the more. The HDR10 highlights of the recently released 4K/HDR version of the Justice League streamed from Vudu over a Roku Ultra box through the HDMI 2 input were even more impressive, particularly in sequences where Wonder Woman uses her lasso. The magic rope takes on 3D qualities from the intensified glow of the HDR brightness and color grading. Similarly, the color and specular highlight details from the HDR10 in the 4K Ultra HD Blu-ray version of Dunkirk were strikingly realistic, even against the somewhat muted color grading that conveys the stark emotion of the desperate struggle of English infantrymen. Shadowed areas were inky black, yet revealed subtle details and color within the dimmed surroundings. Unfortunately, we weren’t able to get any Dolby Vision content to play, as none of our supporting devices had yet received a necessary firmware update to present it on Sony 4K Dolby Vision-capable displays. In addition, the 65A1E surpassed the wide color gamut threshold of 90 percent of the Digital Cinema Initiative P3 color recommendation for professional movie projectors at a nearly perfect reading of 98.9% of P3. Calibration: Like the 2017 LG W7 4K OLED model we tested earlier, Sony’s 65A1E was pretty close to dead on in color accuracy, gamut and brightness settings (for a dim environment). We only needed to make minor adjustments to white balance (-2 Red Gain and -5 Blue Gain) for both SDR and HDR content. Off-Angle Viewing: One of the key benefits of Sony’s 4K OLED television, or any OLED television for that matter, is the ability to show a brilliantly contrasty and colorful picture even from a wide angle from center screen. Off-angle viewing has long-been the Achilles heel of LED LCD TVs, and is perhaps the best reason of all for considering the purchase of a 4K OLED TV today, especially if you have plans to wall mount the television. This is because mounting an LED-LCD screen above eye level and/or in a location where viewers will have to watch the picture from the left or right sides of the screen will cause colors and contrast to fade the further you move from the center sweet spot. Not so with OLED technology. Like plasma TVs before it, OLED affords the widest viewing angles possible on a flat-panel TV. Colors are rich, and shadows are dark and black when viewed from almost anywhere in the room. Uniformity and image retention: The screen on our A1E review sample had very respectable uniformity with none of the obvious jail bar shadow pattern effects we’ve seen from some lesser-quality LED-LCD TVs. There was some dark shadowy smudging on a gray test screen, but this was very faint with no discernible pattern to make it glaringly visible through real-world content. On a black test screen, the uniformity was perfect. Similarly excellent was the screen’s ability to resist color or hue shifts when viewing from the left or right angles. One of the weaknesses of OLED technology is its sensitivity to image retention, or “burn-in,” which can result from leaving a frozen or static picture or pattern on the screen for a prolonged amount of time (10 minutes or more). It manifests as a lingering ghost or outline of the frozen image (like a stock ticker, channel logo or video game background element) when the scene suddenly changes to a new scene. This was an issue which plagued plasma televisions in the early stages, but as with that older technology, OLED engineers have developed mechanisms for limiting, reducing and clearing up these artifacts. All you have to do is let live content play for a few hours. Our aim in checking for image retention wasn’t to try and do any intentional damage to the loaned test display we used, but rather to see if any image retention would result from normal use cases, like leaving the Bloomberg Channel on all day, or freezing a DVRed picture for 10-plus minutes. While we did see a faint issue of image retention in the DVR test, it was not overtly apparent. We really had to look for it against live programming, and the effect was gone after about an hour. We can’t say what such trials would do to the screen after years of abuse, but from this unscientific life-in-the-real world use case, we’d say you don’t have much to worry about if you take some common sense precautions. For example, turn the screen off if you pause a program on a DVR to take a phone call or run off to the bathroom. Also, don’t let young kids leave their video games playing when they aren’t engaged in the action. That’s what that old LCD TV is for. Experts say today’s OLED televisions should be expected to have a good long life-span comparable to many LCD TVs, but the “organic” nature of compounds used in the technology make them susceptible to aging. But in this reviewer’s estimation, the chances are another component on the TV, like a power supply or circuit board, will go long before the panel aging becomes a problem, if the set is properly cared for. Gaming: The Sony XBR-65A1E is a pretty good display for video game play, although it’s probably not the best choice for serious competition gaming, especially in Full HD. We tested a lag time of 47 ms in Full HD 60 fps SDR mode, which is not at the top of the class as gaming televisions or monitors go, but, impressively and counter intuitively, the A1E did manage a 30 ms lag time running 4K/HDR, which isn’t bad at all. We tested some 4K HDR games using the Xbox One X console and found the images brilliantly clear, responsive and colorful. That said, the specular highlights in bright sections of games like Forza Motorsport 7 were not as hit-you-over-the-head evident as they are in some movie content, but they are nevertheless better than the same game in SDR. Colors and reflections do standout more, making the CGI effects take on a new luster of realism. Keep in mind that to use 4K/HDR gaming with the Xbox One X and certain other devices, you will need to setup the A1E properly. First, you will need to connect the HDR gaming console to the the correct HDMI inputs (Nos. 2 and 3). Then, in the home-screen settings menu under the “External Settings” sub menu set those inputs to “Enhanced.” Out of the box the HDMI inputs are set to the default “Standard” support of 10 Gbps. Enhanced mode sets it to 18 Gpbs, which is required for HDR game play. It’s also required by select external HDR devices, such as the Roku 4, Roku Ultra or Apple TV media players, which currently output everything including movies at 60 fps and require 18 Gbps capability. Smarts: Sony TVs use the Android TV OS, which is one of the best for app selection, codec file support, and voice interactivity. However, lag issues with app loading can be annoying. The Android TV platform allows the use of Google Cast, so that users can streaming videos through a smart mobile device and cast the image onto the big screen through a wireless connection. For 4K HDR streaming, the TV supports the Amazon and Netflix 4K apps with HDR, Sony’s Ultra service and Google Movies PlayStore. Sony also allows its 2017 TVs to work with both Google Assistant voice in put using a supporting smart speaker or Amazon Alexa, the latter through a connected separate Amazon Alexa far-field voice input device like a Echo speaker. Picture processing: Sony’s picture processing might be the best in the business, although advances by both Samsung and LG are getting closer. In the A1E, this is demonstrated particularly well in processing smooth color transitions, such as the shades of color surrounding a setting sun, or in underwater scenes, when a camera is pointed toward the surface. In weaker systems (or in television’s with less than a true 10-bit panel), the different shade transitions standout as unnatural looking bands. These were almost completely absent on the A1E. The set also does a superb job with mosquito noise from MPEG compression or low-light artifacts. In our torture test using the Blu-ray version of Pirates of the Carribean: At World’s End, the noisy backgrounds in the opening dark water scenes were clear, while film grain effects were preserved. This TV also does an exceptional job with upconversion of lower-than-4K-resolution content, including SD DVD-sourced movies. This is important, since libraries of native 4K content are likely to be slow in catching up to Full HD 1080p, 1080i and 720p material for some time. Motion handling: Although OLED TVs are not immune to motion blurring and judder, like LCDs, the Sony XBR-65A1E does an excellent job handling these issues in both sports and movie viewing. Sony offers its MotionFlow technology in the picture settings menu, and this can be user-adjusted to dial down blurring when or if its noticed. However, this does have an impact on noticeable soap opera effect, where images can become overly sharpened to the point that film-based content can start to look like live video. Certain types of content will also produce noticeable judder from time to time, but this is handled better than most LCD TVs and when apparent it’s typically fleeting. Inputs: The Sony 65A1E has an excellent assortment of inputs arranged horizontally along the back of the built-in table mount. These include four HDMI 2.0b/HDCP 2.2, three USB ports and one composite video input (component video is not supported). Also included is a optical digital audio output an RF antenna input and an RS-232 port. Conclusion: The 65-inch Bravia XBR65A1E was Sony’s first attempt at entering the 4K Ultra HD OLED TV market and it did a brilliant job of it. Although the picture performance is very comparable to that of LG’s excellent 2017 4K OLEDs, the three Sony A1E models standout in cosmetic styling and in dynamic integrated sound technology. In fact, these sets look like modern art, with a tilted-back photo frame-like stand that when viewed from an angle makes the television appear to defy gravity. The sound system is like no other TV speaker package before it. It’s almost as fascinating to feel the sound vibrate the ultra-thin panel as it is to watch and listen to the aural effects follow objects around on the screen. The knock is that the integrated stand is a tad bulky behind this elegantly svelte ultra-thin panel display, which might bug someone wanting the set to fit as close to flush as possible against a wall. At the currently listed selling price of $3,498, the Sony 65A1E fits right between LG’s 65C7P at $2,596.99 and 65E7P at $3,996.99 models, and the difference between those two is pretty much cosmetic. Again, the picture quality on all of these sets is very comparable. So the decision comes down to personal preference on cosmetics, whether or not you are going to use that very cool Sony on-board sound, and if you would rather have a Sony TV or an LG. We therefore award the Sony Bravia XBR65A1E five out of five hearts. The Sony XBR-65A1E used for this review was a company loan.